Mizuno Toshikata (1866 - 1908) Escape on a Boat, c.1894. Oban Triptych. If Toshikata had been born a few decades earlier he would probably be remembered along with some of the great artists of the nineteenth century. 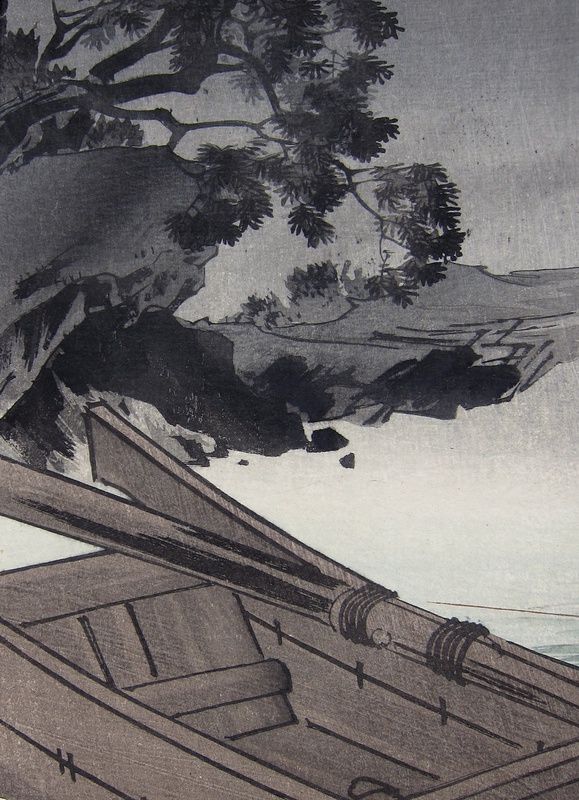 Unfortunately for him, the demand for imaginative and costly woodblock prints had all but died out until the advent of the Sino-Japanese war in 1894 when for a brief time there was an intense demand for journalistic images from the front. It was here that this hugely talented artist found work. He produced a number of contemplative and subtle moonlit scenes which are among the best of the late nineteenth century. The half dozen outstanding triptychs are justly well known and this piece is among his best. Other prints of the war tend to be filled with bombast - explosions or mountains of corpses. Toshikata generally chose quiet moments of individual heroism as in the case of this portrait of Sergeant Kawasaki Iseo. 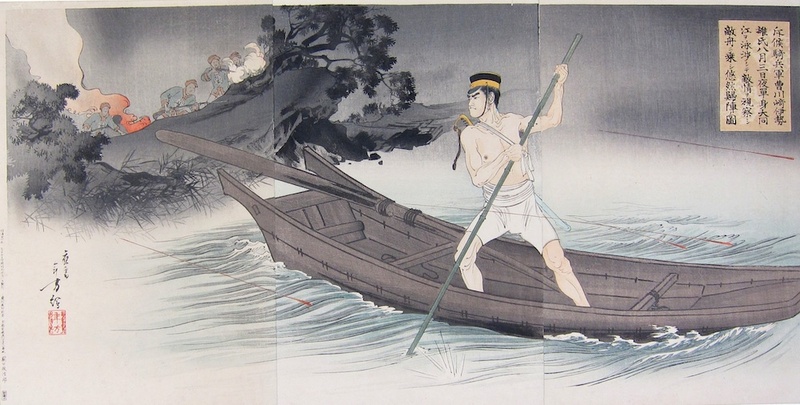 Toshikata pictures the brave officer escaping a Chinese encampment having forded the river alone to spy on the enemy. We see him making off in a stolen boat amid a hail of whistling bullets. But, aside from the military drama here we have a subtle and beautifully realised composition… playing as it does with exceptional tones of bokashi shading to create the atmosphere of the still, moonlit river scene. This is grand and adventurous woodblock printing at its best, and as usual with Toshikata there are discreet pockets of action: the Chinese appearing from the river mist at the left and the heroic soldier standing in the boat; elsewhere everything is encroached upon by darkness and mist... there are almost no edges in this print, which defies in a sense the natural qualities of the medium. The print is unattached, full size sheets with margins in perfect condition. A fine impression and fine colour. Signed Toshikata with seal. Published by Sekiguchi Masajiro.